During puberty, menstruation or pregnancy, there is increased production of hormones. These higher levels increase gum sensitivity and lead to greater irritations from plaque and food particles. The gums can become swollen, turn red and feel tender. The artificial use of hormones in oral contraceptives or post-menopausal hormone replacement therapy can cause similar symptoms. These symptoms usually clear up as the amounts of hormones decrease, for example once menstruation begins or pregnancy ends. Sometimes during pregnancy, between the second and eighth months, large lumps may appear as a reaction to local irritants. These growths are generally painless and are not malignant/cancerous. They may require professional removal, but usually disappear on their own after pregnancy. 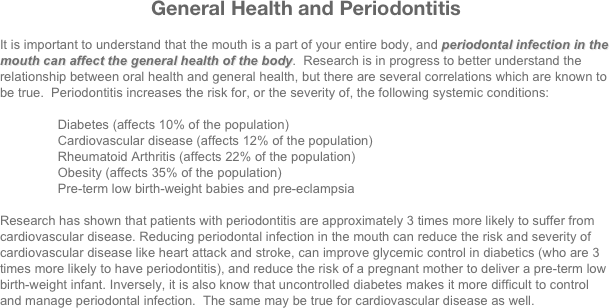 Periodontal health should be part of your prenatal care. Any infections during pregnancy, including periodontal infections, can place a baby’s health at risk. There is also a higher incidence of pre-term low birth weight babies in women with periodontitis. the teeth can even be lost. mouth, as well as infection (pus) coming from the gums. 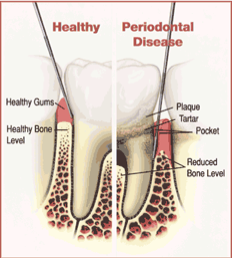 There are two main forms of treatment for periodontitis: surgical and non-surgical. You can find more information about these procedures under their respective links. The best way to prevent cavities and periodontitis is by good tooth brushing and flossing on a daily basis to remove the damaging bacteria. These bacteria cannot be eliminated from the mouth, but they can be kept under control and kept from causing more bone loss. Other factors which can negatively affect your periodontal health include tobacco smoking, diabetes, stress and hormonal changes, clenching or grinding of your teeth, certain medications, poor nutrition, and genetics. Because of these other factors, sometimes even with the most diligent oral home dental care, people still develop some form of periodontitis. If this is the case, professional intervention is necessary to prevent its continued progress. The non-surgical and surgical links on the following pages will describe in more detail what you can expect with regard to your potential care in our clinic.